I’ve supported companies using older components as precedents for their modern catalog and I still do. One thing’s for certain though, I’ll still prefer the originals and I’ll hunt them down. Not everyone feels the same way and that’s why we see so many “copy-cat” components. Andy and Jussi share my sentiment for sure. Sometimes, it’s just too cheesy. But let’s face it. Modern companies are mass-producing lugged steel framesets in the carbon age. Are these bikes “cheesy” and “copy-cats” too? Sometimes yes, but it’s still offering people who can’t hunt down the De Rosa frame with Campagnolo 151 Pista cranks in 165 an option. 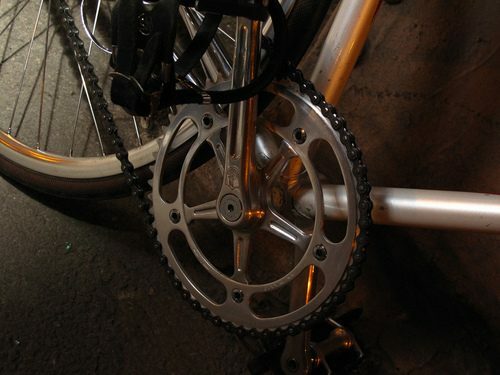 There are many riders out there who prefer the throwback stylings of the fluted cranks and would rather buy a modern crank that looks like the vintage predecessor than an Andel or similar. This is a calling to Campy. If you’re listening, please please please reissue a fluted crank! You would slay the market.